Join us for a Public Workshop on Wednesday, May 15 at the Kalmar Nyckle Foundation, 1124 E. 7th Street, Wilmington. Stop by anytime between 4 and 7 pm. During the workshop you’ll have the opportunity to review and prioritize proposed improvements to the East 7th Street Peninsula. Click the image below to share on social media. 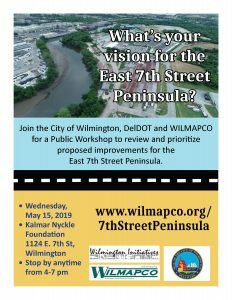 The City of Wilmington, Delaware Department of Transportation, and WILMAPCO have begun a Master Plan for the East 7th Street Peninsula located in Wilmington, Delaware. 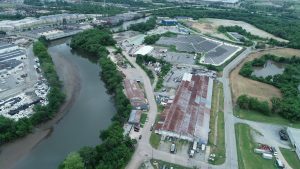 The East 7th Street peninsula is located at the confluence of the Brandywine Creek and the Christina River. The sole vehicular and bicycle/pedestrian access points are via Swedes Landing Road. The limited access has impacted economic growth for the peninsula and private investment. 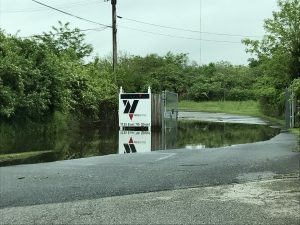 The roadways are also subject to flooding during storm events, which compromises the limited access even further. The goal of this project is to prepare a master plan which identifies and prioritizes the implementation of necessary roadway and utility improvements. The plan will evaluate and recommend land use and development potential that will attract suitable public/private investment opportunities to facilitate future economic development on the East 7th Street Peninsula. The study also seek to evaluate existing land use and public open space and make recommendations for appropriate waterfront mixed use development opportunities, maximize potential public/private investment; and promote overall economic development of the site. For additional information or to share your thoughts, please contact: Dave Gula at (302) 737-6205 or email dgula@wilmapco.org. 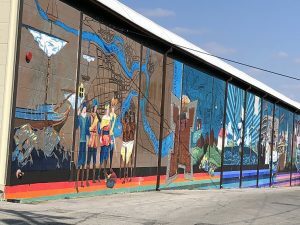 The study will include an engineering feasibility analysis to determine small to large scale recommendations for topics involving flooding, transportation, public transit, land use, zoning, preservation of cultural and historical resources, environmental constraints, recreational amenities and connecting the Peninsula to its community neighbors, Eastside and Southbridge. It will be important for the recommendations to also work with the current property owners. Prepare design plans for recommendations as funding becomes available.